It is not long America. Season 3 of Downton Abbey will be on PBS Sunday starting January 6. It is time to start getting into the ritual of saving your Sunday nights to watch a Downton episode on DVD, with wine/chocolates, or a cuppa with biscuits or tea treats. Amazon actually has a streaming service so you can download the episodes and watch instantly which is great if you don’t have iTunes. Check out the links below. Last night’s episode, S3E5 of Downton Abbey was powerful and I strongly advise those of you outside of the UK who are not able to watch the new episodes to stay away from Social Media to avoid seeing any of the major spoilers, but there was enough drama going on in the kitchen to keep me on my toes. What beginner or non-cooks don’t realize is that not all dishes turn out perfectly. 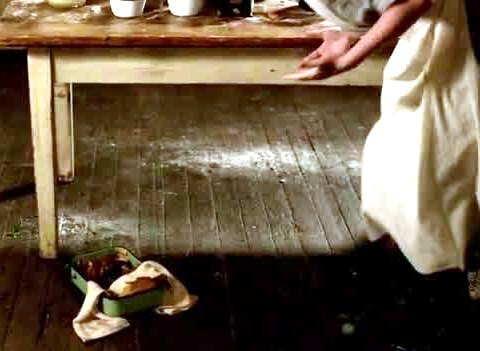 Some disasters make it to the dining room, like the salted raspberry meringue, but for the most part an experienced cook will find ways to divert a crisis. The chicken which landed on the floor was dusted off and sent on its way, the shoddy ingredients for the test wedding cake discovered before anyone actually had to eat it. I am a big fan of testing while I cook! I just lived through “Substitution Saturday” breakfast preparations as weekend guests slept downstairs, when I discovered I was out of applesauce (made puree of canned pears), out of milk (had powdered skim milk), low on eggs (but had frozen egg whites in the freezer). You learn to be quick on your feet, even at 6 am. 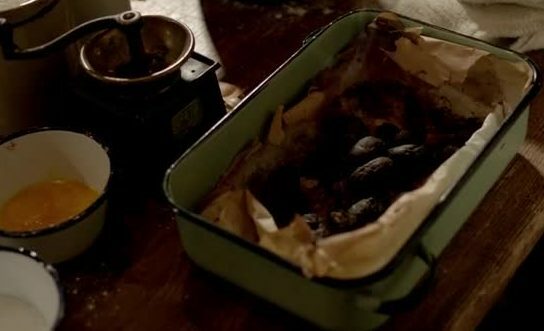 This week on Downton we had two kitchen disasters. I was suppose it was about time that another dish ended up on the floor. This time it was kidney soufflé, which was already burnt so I am not sure it was a great loss. I love the taste, but not generally fond of the smell of offals as they are cooking, memories of when my mother used to cook liver. The other crisis was the hollandaise sauce which had curdled. Yes that does happen if it is kept heated too high. This is an easy fix, but it seemed like a magical cure just at the right time. Well, actually when it happens to you it does seem like a magic cure to save the day. There are many ways to soufflé, so you might want to be inspired to make one, but not necessarily this recipe. The famous French Chef Auguste Escoffier listed 70 recipes in one cookbook alone. My favorite is chocolate soufflé, which is great for those special romantic occasions. 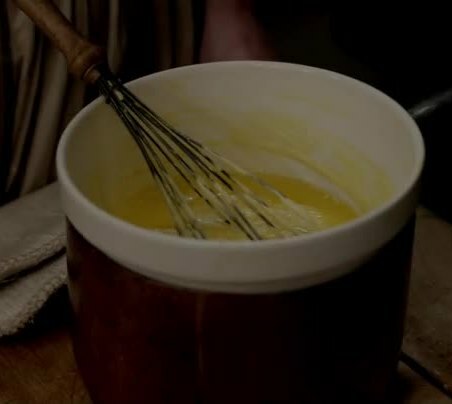 Heat oil in a saucepan and whisk in the flour. Gradually add stock and cook over low heat, stirring until smooth and thickened. Add salt, yeast and oregano. Remove from heat and cool. Blend in beaten egg yolks, kidney and sunflower seeds. Fold in egg whites which have been stiffly beaten. Turn mixture into an oiled casserole or oiled individual custard cups. Bake at 350 F. for 30 minutes. Serve immediately or your soufflé willl deflate. Sauces are what make French cuisine so distinctive. Hundreds of sauces were developed over hundreds of years. Auguste Escoffier, the famous Edwardian chef was key to bringing French cuisine to the upper classes to Downton and other grand houses in that era. He is credited for narrowing the list to five mother sauces. From these five, many variations, or daughter sauces can be made. Béchamel is milk based, thickened with a white roux. Espagnole is a brown veal stock sauce. Velouté is a white stock based on stock, thickened with a roux or a liaison. Hollandaise, an emulsion of egg yolk, butter and lemon or vinegar. Every cook should be able to make classic French Mother sauces, and hollandaise is one of the great ones, perfect for asparagus, fish and American favourite Eggs Benedict. Escoffier’s hollandaise sauce set the standard to follow. There is some disagreement between using lemon juice or vinegar in the sauce but I always defer to the Master, so vinegar it is. This serves 20 people (or 6 hungry men) but freezes great. Put the salt, the mignonette pepper, the vinegar and water ina small saucepan and reduce by 3/4. Move the saucepan to a corner to a double boiler, and add a spoonful of cold water and the yolks. Beat with a whisk until the yolks thicken and have the consistency of cream. Then remove the pot to a tepid place and gradually pour the butter on the yolks while briskly stirring the sauce. When the butter is absorbed the sauce ought to be thick and firm. It is brought to the correct consistency with a little water, which also lightens it slightly, but the addition of water is optional. The sauce is completed by a drop of lemon juice, and rubbed through a fine sieve. Keep the Sauce Warm, Not Hot: As I mentioned before, if hollandaise is kept too warm, it will thin out or curdle. The best way to keep it warm is by putting over a pan of lukewarm water, very It can be held perfectly. If the sauce is too Thick: beat in 1 to 2 tablespoons of hot water, vegetable cooking liquid, stock, milk, or cream. If the Sauce Refuses to Thicken: if you have beaten in your butter too quickly, and the sauce refuses to thicken, rinse out a mixing bowl with hot water. Put in a teaspoon of lemon juice and a tablespoon of the sauce. Whisk for a moment until the sauce creams and thickens. Then whisk in the rest of the sauce half a tablespoon at a time, beating until each addition has thickened in the sauce before adding the next. Your patience will be rewarded. The Downton Cure when the Sauce has Broken or “Curdled: if a finished sauce starts to separate, a tablespoon of cold water beaten into it will often bring it back. If that fails, whisk another egg in a separate heated bowl, and then slowly whisk in the curdled sauce. Leftover Hollandaise: you can keep leftover hollandaise for a day or two refrigerated but freezes great. You can add it to other sauces as well to enhance flavour. To reheat, whisk a couple of tablespoons over very low heat or over another pot of simmering water, then gradually whisk in the remaining sauce. I adore your blog! What a joy it is to read every week. What a heart breaking show last night–gosh! Thanks, I really appreciate you taking time to say you enjoy reading. I used to post more times a week but I do have a day job and trying to finish my cookbook. My roommate is obsessed with Downton and this seems like a great way to build suspense over the new season. With these recipes, I may even get more excited about the premier. I just read an article, and it got me ready to start this Downton season off right. You girls make watching shows such a culture-building experience. Love it! A cook and historian fascinated by the fine, yet simple food of the post Edwardian period of Downton Abbey. Food makes history more fun. I live in Toronto with my husband, Lord D.